Здесь представлена один из разделов четвертой главы каталога, сопровождавшего выставку работ художника эпохи Возрождения Фра Анжелико (15 век) в Музее искусств Метрополитен в Нью-Йорке в 2005 году Каталог составлен кураторами этой выставки Лоуренсом Кантером и Пиа Палладино. 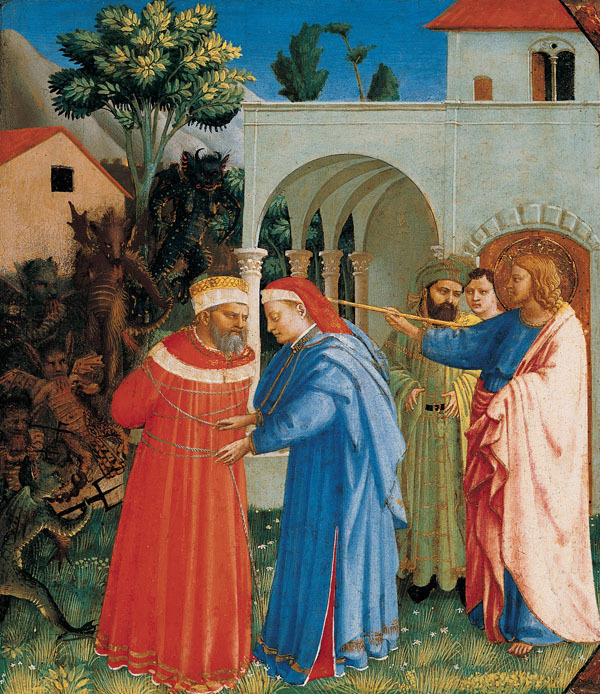 The magician Hermogenes summoned devils to ensnare Saint James, but the apostle turned them on Hermogenes instead. The devils bound Hermogenes, but James ordered him freed as an act of Christian charity, and offered him his own staff as an amulet against the demons. Struck dumb for doubting the angelic message of his son's birth, Zacharias wrote on a tablet, "John is his name," and he was immediately cured. According to The Golden Legend, Saint Lucy, ria princess of Siracusa, brought her mother, Eustochia, to the shrine of Saint Agatha to be healed from an unstoppable flow of blood. Falling asleep before the tomb, Lucy beheld Saint Agatha in a vision, and was told that she herself had the power to cure her mother if she would dedicate her life to the poor. The episode of Saint Dominic recognizing and embracing Saint Francis, who had been commended to him by the Virgin in a dream, was popularized by Jacopo da Varagine's account in The Golden Legend, although it was rarely portrayed in art before Angelico's many paintings of the subject. The reconstruction of the altarpiece to which these ten panels belonged has evolved gradually over the past several decades. Roberto Longhi first intuited a connection between the Naming of the Baptist and Saint James the Greater Freeing the Magician Hermogenes,(*1) and a connection between these two panels and the Meeting of Saint Dominic and Saint Francis and the Burial of the Virgin was established by Keith Christiansen and Everett Fahy. (*2) The present writer added the fifth panel of the predella, The Appearance of Saint Agatha to Saint Lucy,(*3) and also suggested that The Blessing Redeemer from the English Royal Collection (H) in Hampton Court Palace, together with the Two Adoring Angels, now in the Galleria Sabauda, Turin (I), may have formed the central pinnacle of the altarpiece. (*4) The Turin and Hampton Court panels had previously been associated with the cropped central pinnacle of the San Domenico high altarpiece (see cat. 10), but they are somewhat later in style than that work, and are closer in this respect to the predella panels reunited here; furthermore, their combined width corresponds approximately to that of the Philadelphia panel. X-radiographs of the Hampton Court Redeemer show the structure of the panels of which it is composed as well as evidence of the removal of engaged moldings along its top edges, clearly indicating that it originally formed the central pinnacle of an altarpiece rather than of a smaller triptych or tabernacle,(*5) and that the frame of this altarpiece conformed in type to that of the polyptych (fig. 143) attributed to Fra Angelico in the Museo Diocesano, Cortona, or to the Trinity altarpiece of 1429 now in the Museo di San Marco, Florence (see cat. 24). As in these altarpieces, it is likely that the lateral panels — combining two standing saints beneath ogival arches on each panel: Saints James and John the Baptist on the left and Saints Lucy and Dominic or Francis on the right — also contained images of the Annunciatory Angel and the Virgin Annunciate on their pinnacles. It now seems that this was the original disposition of the two fragmentary panels in Detroit,(*6) which, additionally, are stylistically related to the Hampton Court Redeemer and to the five predella panels reunited here, and are of an appropriate size to have joined them in a single complex. Dates proposed for all these panels have generally hovered in the vicinity of the later 1420s, on account of their similarities to Masaccio's spatial experiments in the Brancacci Chapel first pointed out by Roberto Longhi.The five predella panels were specifically discussed by the present writer as midpoints in the development of Angelico's style between the Prado Annunciation altarpiece and the Louvre Coronation of the Virgin altarpiece,(*7) but assigning them to 1426-27, based on an overly precocious dating of the Louvre Coronation, now seems to be too early. 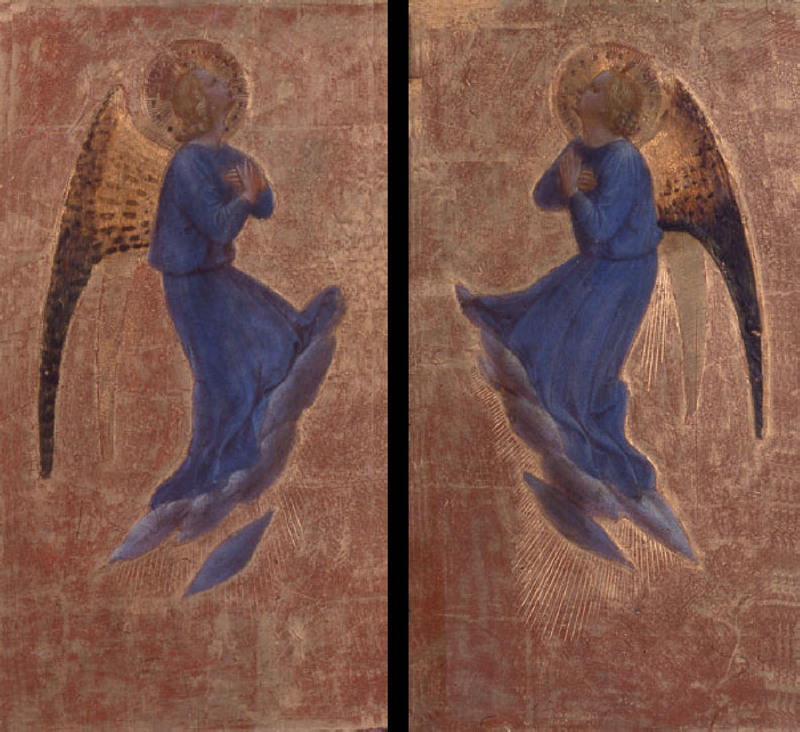 Considering the more sophisticated treatment of ambient detail and the more solid modeling of the figures in these panels, it would seem that they followed rather than preceded the otherwise closely related panels from the Franciscan predella of about 1428-29 (cat. 24). At the same time their figure canon does not reveal the greater attenuation evident in such slightly later paintings as the reliquary of the Annunciation and the Adoration of the Magi (see cat. 28) of about 1431-32, or the predella of the Louvre Coronation of the Virgin of about 1432-34. A date of about 1429-30 for this partially reconstructed altarpiece seems most likely. The identification of the panels from the main tier of this altarpiece remains elusive. While it is now possible to specify the subjects of the lateral panels, it is doubtful that the full-length Saint James formerly in The Minneapolis Institute of Arts and sometimes associated with the Kimbell predella panel could have been among them. Its relation to the other panels is exclusively iconographic: it is divergent in size and format, while its style is impossible to judge from its apparently damaged and liberally retouched state. The central panel of this complex probably represented the Virgin and Child and certainly terminated in an ogival arch. 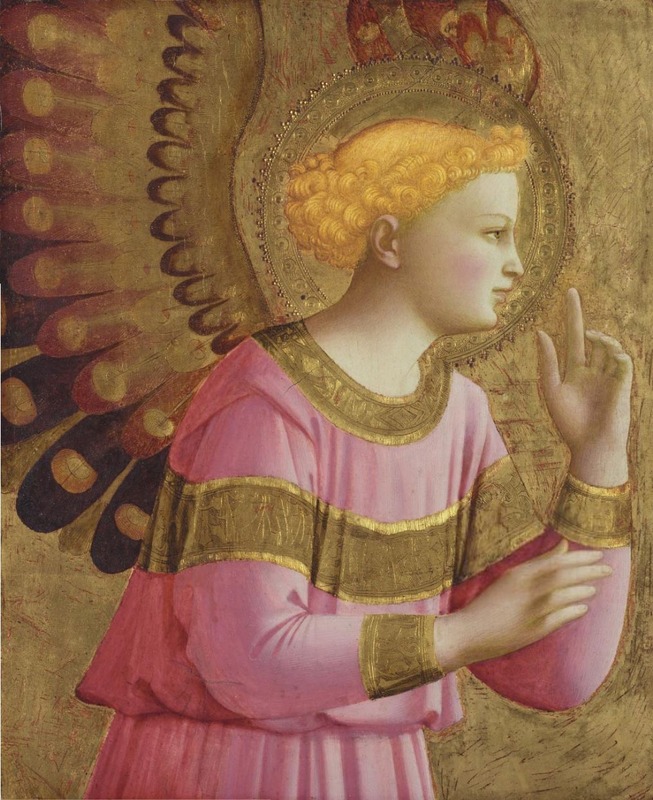 The only surviving panel by Fra Angelico of this subject and of a suitable size and format is the so-called Pontassieve Madonna in the Uffizi, Florence (fig. 70). Рис. 70. Фра Анжелико. Мадонна с Младенцем (Мадонна Понтассива). 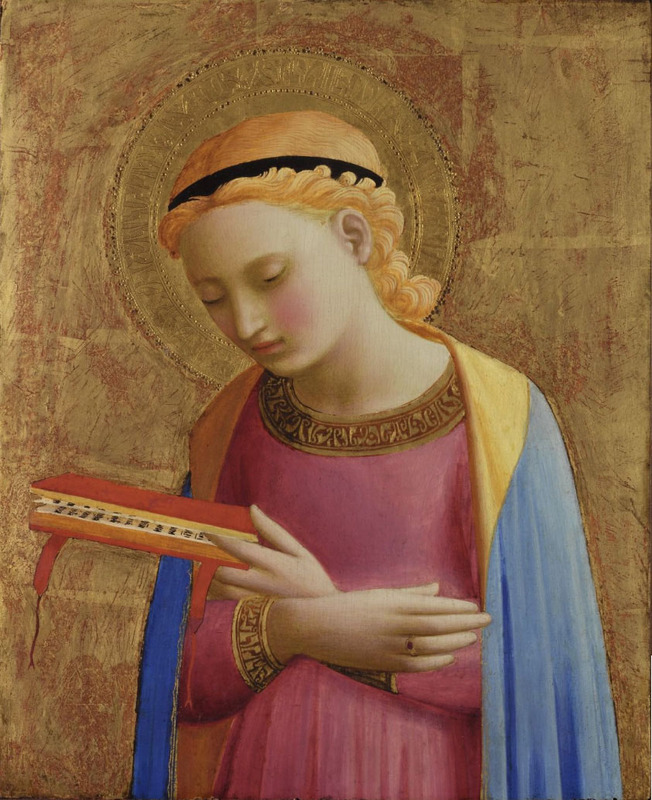 Although this painting is traditionally dated to a more mature period in the artist's career,(*8) its gold ground and ogival-arched shape, coupled with the flat projection of the Virgin's throne, make it unlikely to have been painted later than the second half of the 1420s. More specifically, the incipient attenuation of the figures and the modeling of their heads and facial features situate this panel midway between the Madonna from the Franciscan altarpiece (1428-29), now in the Museo di San Marco, and the Cortona Annunciation (about 1430), making it a highly plausible candidate for the missing central panel of this complex (fig. 71). 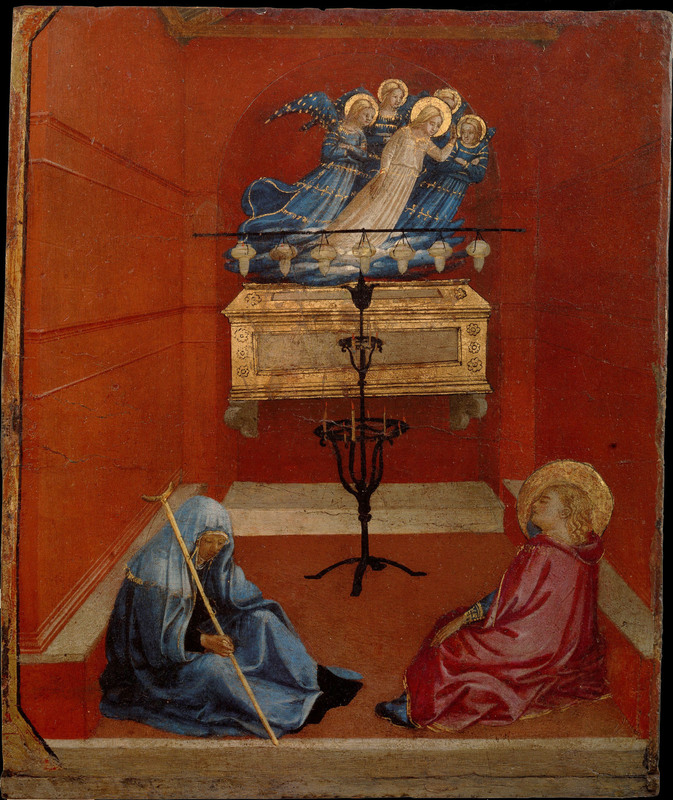 The presence within the predella of this altarpiece of two relatively uncommonly portrayed saints — James, and, in a position of honor, Lucy — led this writer to speculate that its original location might have been the Florentine church of San Jacopo (James) in Campo Corbolini. This church was the seat both of the Knights of Malta, dedicated to Saint John the Baptist, and of the Compagnia di Santa Maria del Giglio (or dei Ciechi), dedicated to Saint Lucy. (*9) While the suggestion remains plausible, no documentary confirming evidence has emerged, and therefore other circumstantial possibilities for the provenance must remain open.Among these is the church of San Domenico in San Miniato al Tedesco, which originally was dedicated to Saints James and Lucy. Like many Dominican establishments in outlying areas of Tuscany, this church underwent a program of renovation in the early years of the fifteenth century. 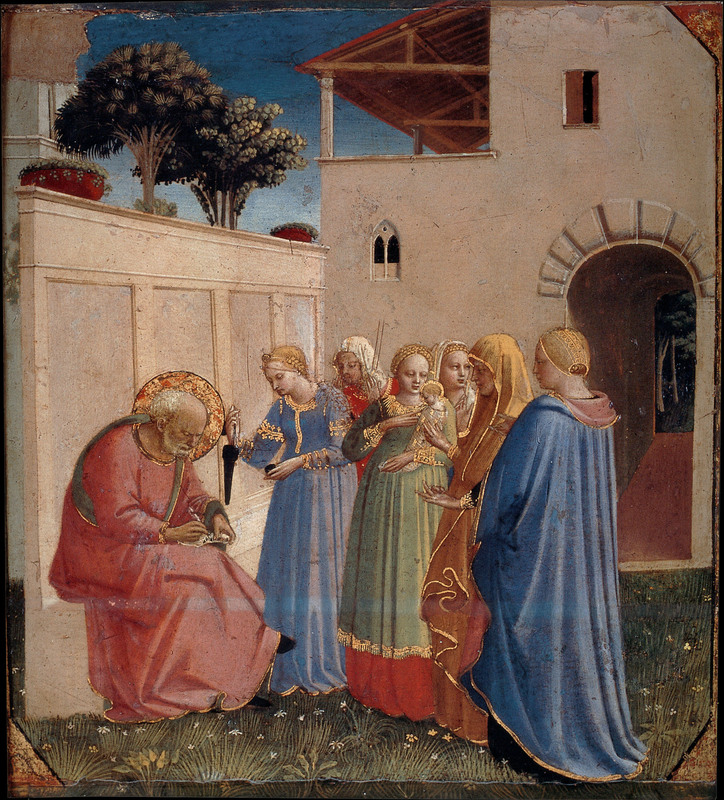 (*10) However, the fact that the Naming of Saint John the Baptist was copied by Andrea di Giusto in 1435 for the predella of an Olivetan altarpiece (now in the Museo Comunale, Prato) that otherwise borrows heavily from Lorenzo Monaco's altarpiece from San Benedetto fuori della Porta a Pinta in Florence(*11) might argue that Angelico's altarpiece was publicly accessible in Florence rather than in San Miniato al Tedesco, which was more frequented by painters from the provinces of Pisa. 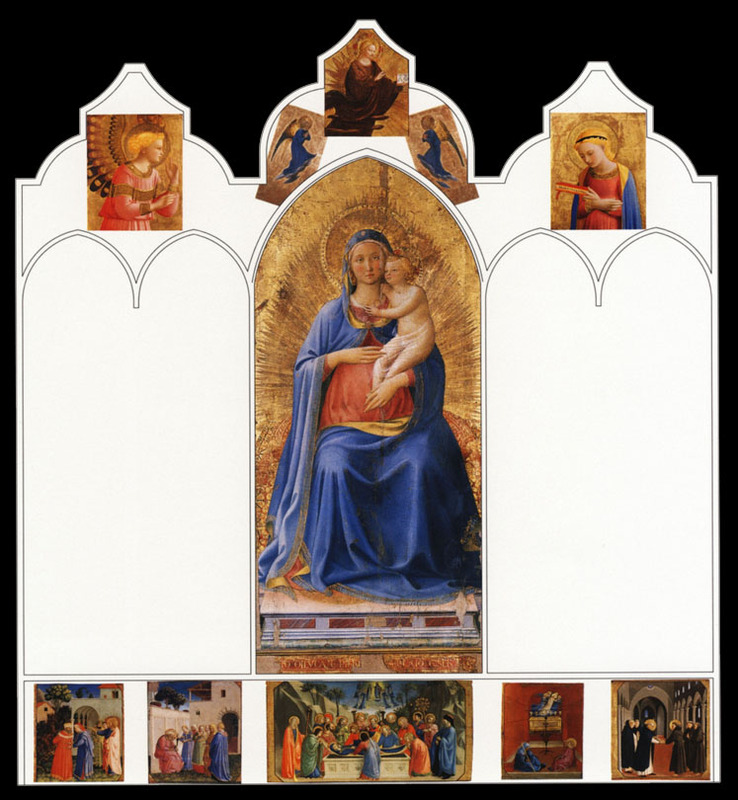 If it is possible to accept the Pontassieve Madonna as the central panel of this altarpiece, yet another solution may be considered. This panel was discovered in the Prepositura di San Michele Arcangelo at Pontassieve in the suburbs of Florence, and while it is conceivable that it was originally intended for that site, more likely, given its fragmentary state, is that it was transferred there from a Florentine church following the Napoleonic suppressions (or some other calamity) of the late eighteenth century, probably as the property of the largest landowners at Pontassieve, the Da Filicaia family. Along the base of the Pontassieve Madonna is a partial inscription recording the names of three men who may be presumed to have been the donors of the altarpiece:"... TONIO DI LVC.A E PIERO DI NICHOLAIO E SER PIERO ... "; almost certainly, the references are to Antonio di Luca di Manetto da Filicaia (b. 1389 — d. before 1449), Piero di Niccol6 di Manetto da Filicaia (b. 1399 — d. before 1438), and Ser Piero di Betto di Marco da Filicaia (1384-1443). (*12) These men, the heads of three branches of the Da Filicaia family, were all residents of the Gonfalone della Chiavi in the quartiere di San Giovanni, in the parish of San Pier Maggiore, and traced their lineage to a common great-great grandfather. The circumstances under which they might have come together to sponsor the commission for an altarpiece about 1429 or 1430 are mysterious, but it may be assumed that they were in some way related to an ancestral chapel. Three churches in Florence are known to have housed Da Filicaia chapels in the fifteenth century: Santa Maria degli Angeli, San Pier Maggiore, and Santa Croce. The Da Filicaia chapel in Santa Maria degli Angeli, dedicated to Saint Nicholas, was established in 1388 by the endowment of Monna Gemma, widow of Manetto da Filicaia, mother of Luca and Niccolo di Manetto, and therefore the paternal grandmother of two of the signatories of Angelico's painting. Completed in 1390 at a cost of 416 florins, the chapel was provided with an altarpiece by Mariotto di Nardo representing the Virgin and Child Enthroned, with Saints Anthony Abbot, Nicholas, Lawrence, and Francis, which is recorded as in situ until shortly before 1657. (*13) Monna Gemma and her descendants were not buried in the chapel she established at Santa Maria degli Angeli, however, but rather in the family vault at Santa Croce, from which some of them were later translated to San Pier Maggiore. Little is known of the Da Filicaia chapel in San Pier Maggiore other than that it was located in the north aisle between two Albizzi family chapels, that it was dedicated to Saint Julian, that the family was obligated to pay for annual Masses there on the feasts of Saint John the Evangelist and Saint Mary Magdalene, and that it often is mistakenly supposed to have contained the late-thirteenth-century altarpiece of Saint Peter Enthroned by the Master of Saint Cecilia that was subsequently moved to the nearby church of San Simone. 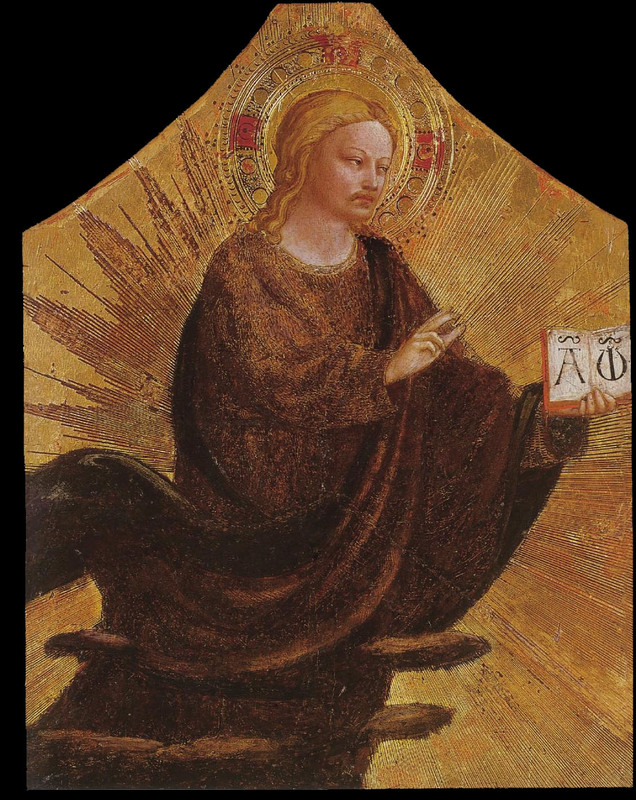 (*14) It is unlikely that this chapel was ever dedicated to Saint Lucy, the principal saint in Angelico's altarpiece, since another chapel at San Pier Maggiore, the rights to which were owned by the Albizzi, bore that dedication. Even less is known of the chapel in Santa Croce, except that it was located "sotto le volte," presumably in the crypt. At least one early document records the presence there of a tomb marker engraved with the coat of arms of Antonio di Luca di Manetto da Filicaia, the principal signatory of Angelico's altarpiece, and identifies the locale as "Santa Lucia da Filicaia. 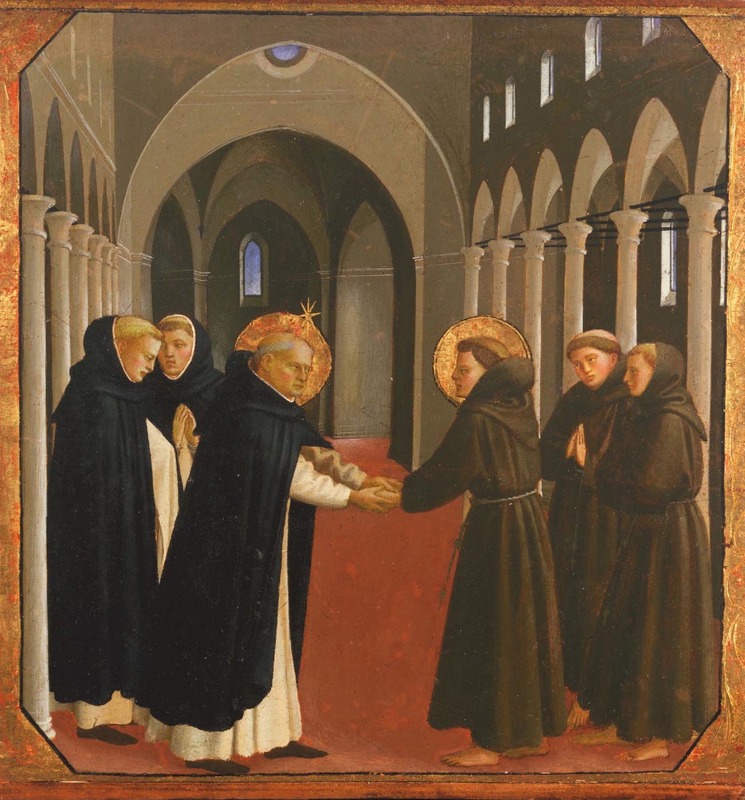 "(*15) If the fourth saint portrayed in Angelico's altarpiece, above the San Francisco Meeting of Saint Dominic and Saint Francis, was Francis rather than Dominic, it is not unrealistic to suppose that Santa Croce may have been the painting's original location. (*1). Longhi 1940, p. 175. (*2). Fahy 1987, pp. 178-83. (*3). Kanter 2000, pp. 3-13. (*4). Cited in Kanter et al. 1994, p. 327 n. 2. (*5). The proposal by Kanter (2001a, pp. 34-37) that the Hampton Court Redeemer might have formed the central pinnacle of the triptych to which the Getty Saints and the Yale Annunciation belonged (see cat. 16) is mistaken. (*6). See C. B. Strehlke, in Kanter et al. 1994, pp. 345-48, for a summary of earlier proposals. (*7). Kanter 2001a, p. 30. (*8). U. Baldini (1970, p. 96) dates it about 1435; J. Pope-Hennessy (1974, p. 226) dates it after 1450; and G. Bonsanti (1998, pp. 107, 154) dates it about 1450. (*10). Pasquinucci 1998, pp. 112-19. (*11). Datini 1972, p. 17; Eisenberg 1989, pp. 100—101. (*12). The correct identification of the third signatory was kindly provided by Alessandro Cecchi, who is preparing an in-depth archival study of the Da Filicaia family. (*13). Spinelli 1988, pp. 44-51. (*14). W. Paatz and E. Paatz (1952, pp. 640-41) note also that the Saint Peter altarpiece may have been in the sacristy of San Pier Maggiore, whose patrons were the Benvenuti family; M. Bietti Favi (1990, p. 243) identifies the Saint Peter Enthroned as the original high altarpiece of that church. The Da Filicaia apparently owned rights to a second chapel in San Pier Maggiore, in the tramezzo. (*15). ASF ms. 624, Sepoltuario Rosselli, I, p. 424 n. 268; also ASF, Carte Cenmelli Papiani, 2017, and ASF, Raccolta Sebregondi, 2209, which includes a complete genealogy of the family.